Custom Luxury "New Construction" Home located in Scotch Meadow Estates. 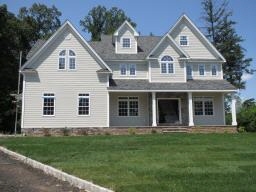 This colonial style home is one of five new homes situated on a private cul-de-sac on the south side of Scotch Plains by the golf course & country club.This distinctive home features 4 bedrooms, 3.5 baths & is beautifully appointed w/ quality amenities throughout. Formal living room w/ fireplace & formal dining room. Gourmet kitchen w/ granite counter tops & wood cabinetry opening to family room. Oak staircase leads to 2nd floor Master suite w/ walk in closet & spa-like master bath, 3 additional bedrooms & 2 full baths w/ walk up attic.1st floor laundry off the 2 car attached garage, powder room & full basement, complete this special home. Convenient to NYC Transportation, top rated schools & premier shopping in downtown Westfield. Custom Luxury "New Construction" Home located in Scotch Meadow Estates. This colonial style home is one of five new homes situated on a private cul-de-sac on the south side of Scotch Plains by the golf course & country club.This distinctive home features 4 bedrooms, 3.5 baths & is beautifully appointed w/ quality amenities throughout. Formal living room w/ fireplace & formal dining room. Gourmet kitchen w/ granite counter tops & wood cabinetry opening to family room. Oak staircase leads to 2nd floor Master suite w/ walk in closet & spa-like master bath, 3 additional bedrooms & 2 full baths w/ walk up attic.1st floor laundry off the 2 car attached garage, powder room & full basement, c omplete this special home. Convenient to NYC Transportation, top rated schools & premier shopping in downtown Westfield.